Post NaNoWriMo Workshops | What's On My Nightstand? 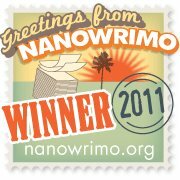 Congratulations to all of our NaNoWriMo* participants and winners. Whether you wrote 1,000 words or crossed the finish line at 50,000 or more, we are proud of you. You are all novelists! Now that you have written the rough draft of a novel (or the majority of one), what do you do next? Let us help you by attending one or both of our post-NaNoWriMo workshops. Congratulations! You are no longer a “one day” novelist, you are now a novelist! Join us for our first post-NaNo workshop where we’ll help you get started on rewriting, revising, and editing your novel. We’ll share resources for writers, as well as tips and tricks to help maintain all that momentum you built up in November. Oh, and we’ll probably do a little celebrating. We just wrote novels, after all! In our last workshop of the 2011 NaNoWriMo season we’ll share resources and tips to help you get your novel published. Whether you plan on seeking an agent, or if self-publishing is more your style, this will be a can’t-miss workshop for Oakton WriMos. You just sacrificed a month of your life for this book, not to mention all the time you’ll put into revising it, so you might as well spread the love and get it published. Besides, we know you’ll donate a signed first edition to the Oakton library once you’re a famous author, right?